Painting in colorful mediums made of oil, acrylic and water take the painter to new places, each one hand crafted and made from memory or by example. The instructions for painting small flowers can be used to fill in around larger environmental images or be the focal point of a small painting. Developing an effective technique is easy. Even if you have never painted a small flower on a canvas before, you can begin to create beautiful oceans of color that show how easy it is to paint small flowers. Set a canvas on your easel of choice. Secure it with the adjustable canvas retaining bracket by sliding the bar down to the top edge of the canvas and tighten the retaining nut. Wipe the canvas down with a clean, lint-free rag. Squeeze paint from tubes onto the artist’s palette with the lightest colors closest the thumb hole and the darker colors the farthest away. Put a dime sized amount of paint on the palette and then the next dime sized amount about 2 inches away. Continue until you have all the colors listed above or a selection of those colors needed to compliment the color of your flowery scene. Pour 1/2 cup of thinner in a clear glass cup and set it slightly behind the front edge of the easel and canvas to keep it away from moving hands during painting. Dip each brush in fresh thinner and dry off the excess on a lint-free rag. Place the brushes in a cup handle down for easy access. Pick up the palette and the 1-inch landscape brush. Load the brush with a dark color. Starting at the bottom of the canvas, paint the first layers of color dark on the canvas moving the brush side to side and then short up and down strokes that are as wide as the ground the small painted flowers will grow from. Clean the brush and load it with a lighter shade of the color to continue creating background and contrast. Dark green to light green can end with beautiful, small yellow and white flowers or a color of your choosing. Clean and wipe excess thinner off the 1-inch landscape brush. Load it with the darkest color of flowering plant you want. Pink flowers should start with the dark pink and layer up to light shades and changing patterns of color across the expanse of the canvas. Push the brush onto the canvas at a 90-degree angle so that the bristle tips bend slightly. Pull the brush away from the canvas and move it to the next open space that will have small flowers covering the painting. Clean the landscape brush and pick up a liner brush. Load it with dark or light color depending on the stems and stalks your flowers will have. Roses have dark stems, while tulips have green stalks. Choose your style and begin to layout the lines of demarcation of stems and stalks of the small flowers you are painting. 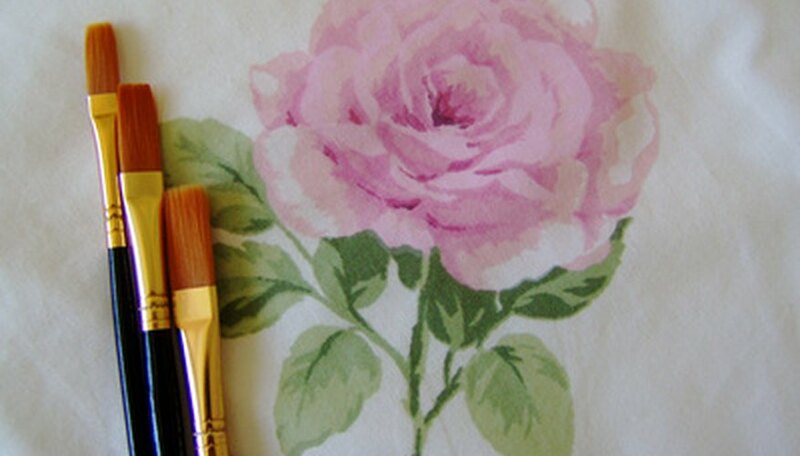 Clean the liner brush and pick up your floral Filbert brush. Load it up with the darkest color that your flowers will have in the foliage. Push the tip of the brush lightly onto the canvas and then pull it away, lifting the tip of the brush toward the sky of your painting. This produces an oblong feature similar to a water drop. Change brushes to the 1/2-inch floral brush and pull the color out from the middle of the paint to its edges. Finish the edges of the petals with a liner brush loaded with the lightest colored paint to produce sharp, clear flower petals. Place each flower over a stem to create the illusion of large flowering plants. Highlight the flowers with light colored paints be repeating Step 5 but with a lighter shade of paint. Moving the brush from one spot to the next and applying lighter paint over dark paint until the highlights bring the right depth and visual enjoyment you intended before you read the instruction for painting small flowers. Use a gel medium to coat the entire canvas prior to working a wet on wet painting technique. Pressing the brushes onto the canvas in different angles will produce different types of petals for small to large flowering plants. Slap a brush with thinner side to side over a dowel to remove as much thinner as possible before reloading. Thinner needs to be removed completely before reloading paint on brushes. This technique works best when the painting starts and ends during one session. Unlike acrylic paints, wet on wet requires a wet paint surface to work.